Like health officials facing outbreaks of disease, internet companies are trying to contain vaccine-related misinformation they have long helped spread. So far, their efforts at quarantine are falling short. Searches of Facebook, Pinterest and Instagram turn up all sorts of bogus warnings about vaccines, including the soundly debunked notions that they cause autism or that mercury preservatives and other substances in them can poison and even kill people. Some experts fear that the online spread of bad information about vaccines is planting or reinforcing fears in parents, and they suspect it is contributing to the comeback in recent years of certain dangerous childhood diseases, including measles, whooping cough and mumps. "The online world has been one that has been very much taken over by misinformation spread by concerned parents," said Richard Carpiano, a professor of public policy and sociology at the University of California, Riverside, who studies vaccine trends. "Medical doctors don't command the sort of authority they did decades ago. There is a lack of confidence in institutions people had faith in." Pinterest, the digital scrapbooking and search site that has been a leading online repository of vaccine misinformation, took the seemingly drastic step in 2017 of blocking all searches for the term "vaccines." But it's been a leaky quarantine. Recently, a search for "measles vaccine" still brought up, among other things, a post titled "Why We Said NO to the Measles Vaccine," along with a sinister-looking illustration of a hand holding an enormous needle titled "Vaccine-nation: poisoning the population one shot at a time." Facebook, meanwhile, said in March that it would no longer recommend groups and pages that spread hoaxes about vaccines, and that it would reject ads that do this. This appears to have filtered out some of the most blatant sources of vaccine misinformation, such as the website Naturalnews.com. But even after the changes, anti-vax groups were among the first results to come up on a search of "vaccine safety." A search of "vaccine," meanwhile, turns up the verified profile of Dr. Christiane Northrup, a physician who is outspoken in her misgivings about—and at times opposition to—vaccines. On Facebook's Instagram, hashtags such as "vaccineskill" and accounts against vaccinating children are easily found with a simple search for "vaccines." The discredited ideas circulating online include the belief that the recommended number of shots for babies is too much for their bodies to handle, that vaccines infect people with the same viruses they are trying to prevent, or that the natural immunity conferred by catching a disease is better than vaccines. In truth, fear and suspicion of vaccines have been around as long as vaccines have existed. Smallpox inoculations caused a furor in colonial New England in the 1700s. And anti-vaccine agitation existed online long before Facebook and Twitter. Still, experts in online misinformation say social networking and the way its algorithms disseminate the most "engaging" posts—whether true or not—have fueled the spread of anti-vaccination propaganda and pushed parents into the anti-vax camp. Jeanine Guidry, a professor at Virginia Commonwealth University who studies social media and vaccines, said social media amplifies these conversations and creates echo chambers that can reinforce bad information. Carpiano said it is difficult to document the actual effect social media has had on vaccination rates, but "we do see decrease in coverage and rise in gaps of coverage," as well as clusters of vaccine-hesitant people. Despite high-profile outbreaks , overall vaccination rates remain high in the U.S., according to the Centers for Disease Control and Prevention. But the percentage of children under 2 who haven't received any vaccines is growing. Some of the fake news online about health and medicine appears to be spread by people who may genuinely believe it. Some seems intended to wreak havoc in public discourse. And some appears to be for financial gain. InfoWars, the conspiracy site run by right-wing provocateur Alex Jones, routinely pushes anti-vax information and stories of "forced inoculations" while selling what are billed as immune supplements. Naturalnews.com sells such products, too. "It is a misinformation campaign," Carpiano said. "Often couched in 'Oh, we are for choice, understanding, education,'" he said. "But fundamentally it is not open to scientific debate." Articles and Discussions on the intersection of Social Media and Healthcare. Relevant to Healthcare Practitioners, Pharma', Insurance, Clinicians, Labs, Health IT Vendors, Health Marketeers, Health Policy Makers, Hospital Administrators. Set goals first. If traffic, leads and sales are part of the goal, then gotta have the next focus be on content creation. Then, using social to share. Can't get much value out of social unless you're actively creating, publishing and sharing content. Daniel Goldberg is widely regarded as a pioneer in Medical Marketing and Public Relations and was an integral part of the transition to Direct to Patient Marketing. Daniel’s unique knowledge of the business of healthcare and patient behaviors allow him to create marketing and public relations campaigns that reach specifically targeted audiences that maximize ROI. His ability to identify markets for potential patients allows GMM’s clients to penetrate new audiences and increase patient volume exponentially. Daniel has also lectured both nationally and internationally on the topic of Medical Marketing at some of the most esteemed medical conferences. Daniel founded Gold Medical Marketing in 2012 after serving as the Director of Marketing and Business Development in a private orthopedic / spine practice and ASC. In the process, GMM has grown to be one of the most successful medical marketing firms and represents medical practices across the country. How Inbound Marketing, Web design, and traditional marketing work for orthopedic brands. Current trends or wellness practices with digital marketing in 2019. Why you should create a Quarterly marketing budget for your health center rather than an annual budget. The top 3 things that a wellness center should be doing online to see a return from their SEM efforts. The top strategy that should be followed, but often marketing teams get wrong. Learn more about how to use Digital Marketing for your Healthcare center. I had a couple of great takeaways from this health care marketing interview and I’m sure that you will as well for your own medical practice. First and foremost, it is ever important to make sure your team understands the goals of the marketing programs that you are running. Are your campaigns geared towards one time transactions and getting somebody in the door the first time they search for a specialty? Are they built around branding and brand recognition? Once this is clearly defined, you can have a greater understanding of how each campaign actually affects your customer acquisition cost and patient growth. The next takeaway is to take the steps towards better understanding your patient journey. It’s not just what happens online, but also their experience within your office. For example, if a prospect sees language online that grows enough confidence in your expertise to give your practice a call, is the front desk knowledgeable about the services that you offer? Can they answer simple questions about the process, the physician, and generally show they place the patient first? Are you making a good first impression with your website, with your social media, with that first phone call? And then lastly, and I think that this is the most important, is thinking about your marketing budget, not as an annual budget, but rather on a quarterly basis. If a campaign is working well for bringing clients in the door and yields a positive ROI from digital marketing for your practice, you do your practice a disservice if the budget for that campaign can’t be scaled over time. Conversely, if you are testing a new marketing campaign with A/B testing and optimization, you can’t decide after a week that the campaign is a failure. Work the systems, work the processes, and, if after 90 days you still aren’t seeing a return, find another avenue to reallocate and test your health center marketing budget. Rather than thinking about your marketing budget as an annual budget, we recommend putting it into three-month increments and doing a quarterly assessment of how your campaigns have either allowed you to reach your marketing goals or where they leave room for improvement. Please be sure to subscribe to the Social Speak Podcast for more interviews with experts in digital marketing for health and wellness businesses. As social media has moved from a toy of the technorati to a mainstream facet of American life, many physicians have learned how to get the most out of Facebook, Twitter and the like while avoiding some of the ethical pitfalls. But if you’re still trying to understand why smart use of social media could help your physician career, AMA member Tyeese L. Gaines, DO (@doctorty), has got the answers. The board-certified emergency physician spent years as a health care journalist, has earned an MBA, recently launched her own urgent-care practice in New Jersey, and offers training to physicians on how to navigate the intersection of medicine and social media. So, if your social media use is restricted to checking in for pictures of friends’ children on Facebook, here is Dr. Gaines’ perspective on why you should consider engaging more deeply at a professional level. Build your brand. “You’re going to be a brand no matter what. It’s just a question of whether you’re going to let other folks do it for you, or whether you put things out there on your own and control your own brand,” Dr. Gaines said. That doesn’t necessarily mean posting 10 times a day to Twitter, Facebook, Instagram and so on, but it does mean finding your niche and seeing what you have to add to the social conversation that is already happening within your specialty or in your local health care community. “You want to make sure you’re up to date on any buzz related to that niche, so that you’re posting, writing or commenting and being part of that conversation.” Social media is not the only way to do that, but smart use can amplify other brand-building efforts such as speaking engagements, medical journal articles or news media engagements. Advance your passion. This will be as unique as you are. Dr. Gaines, for example, did a lot of writing and research on health care disparities during her time as a health care editor, and specifically explored matters affecting the African-American community. “The beauty of social media is that you can reach people who wouldn’t automatically read or digest that information. By using some of the social media tools or hashtags, you can bring your information to a much wider audience than would normally read what you publish” for a physician or medical audience. Teach patients and the general public. Rapid, but thoughtful, reactions to trending medical news stories can be an effective way of doing this. Attract patients. While few patients are likely to trace their decision to seek out your practice to a particular social media posting, the overall impression formed by an active social media plan that highlights the physician’s or practice’s role can tip the scales. Publicize research. “There’s a ton of great research that never makes it to the lay public, and social media is absolutely a way” to spread it far and wide. Engaging with and promoting high-quality research on social media also can help educate medical students and aspiring physicians, as well as help reporters and editors who are looking for story ideas to pursue. Thirty years ago, patient recruitment was a challenge for pharma companies. Today the patient participation rate in trials still hovers around five percent and is not expected to improve anytime soon. Patient recruitment remains a challenge that pharma must work to overcome. I recently spoke to a clinical operations director about patient centricity and social media, and the impact they are having on patient recruitment. Because of a recent job change, this individual has asked to not be identified in the article. However, I do believe these insights are valuable and shed light on how the industry is changing its perspective on patient recruitment. Ed Miseta: How much of the success of patient centricity efforts simply depends on hard work and productivity? Director: It’s definitely a lot of hard work. When discussing what it takes to properly recruit patients, I like to equate it to losing weight. If you want to lose weight, you can’t address one habit. You must address many. You must eat less, you must eat healthy, you must focus on when you’re eating, you need to drink more water, there are things you need to stop drinking, and you must exercise. You also must recognize that what works for one person will not always work for someone else. That is true of almost everything in life, and it is also true for patient recruitment. If you have a study going on at 60 sites, you might have to go to all 60 sites, find out what recruitment strategy works for each, and create a personalized plan. I had to do that once. We did not have a recruitment team. This were three individuals, including myself, who went out and spoke to all 60 sites. I had to live out of a suitcase for about two and a half months, but we did it because it was too important a task to delegate to a CRO. We wanted to have that face-to-face interaction to understand what works at each site. Miseta: How much of a role does patient centricity play in trial recruitment? Director: It plays a huge role. The patient recruitment efforts I just mentioned came after we had discussions with patients. In that instance, we spoke to patients and investigators at the beginning of the trial, before we had finalized the protocol. We asked them to look at the protocol and tell us what they thought of it. We ended up producing a wonderful protocol. Unfortunately, the FDA did not approve it. We had to go back and recreate it, but we were at least able to tell the patients and investigators why we were not able to incorporate some of their suggestions. Miseta: Is there a key takeaway from that? Director: What I continue to learn is that you must always ask yourself, “What more can I do?” Always be communicating with your patients, your sites, and your vendors. Patient recruitment isn’t a one-time thing; it’s an ongoing process. You can’t have one patient recruitment plan. It should always be evolving. Miseta: It seems no matter how hard you plan, some things come up that will always be unforeseen. Director: I hear people say that you need to do proper upfront planning. I agree, but you will never catch everything. I was involved in a trial where we found out during the study that one of the required medications would not be covered by insurers. Even with all the planning we did, and all the people we reached out to, that was something that we didn’t anticipate. When you are thinking about what needs to be done for the trial, throw everything into the discussion, including the kitchen sink. You will find there is no perfect situation for any study. Miseta: Do you recommend working with patient advocacy groups? Director: Absolutely. We partnered with one of these groups for a rare disease trial. We worked with one of these groups to have patients review our protocol. We went to the advocacy group and they provided us with a list of patients who were willing to perform the review. It’s a mistake to ignore any group that can have a very positive impact on your trial. Miseta: Pharma used to find a site and then identify patients. Today we are finding patients and then connecting them with a site. Is this a growing trend? Director: We did both in one rare disease trial. We identified sites but were also able to find patients. Keep in mind that just because a patient has the disease doesn’t mean they will qualify for your trial. A patient might look like a perfect fit, only to be ruled out because of their lab work. I would be wary of opening a site for one patient if you don’t know whether they will make it to randomization. Miseta: Are you using social media for recruitment? Director: We will perform social listening by embedding ourselves in groups that discuss a specific disease. Social listening will allow us to geographically identify where patients are located. Then we can search for clinical sites in that area. Keep in mind that this does not always lead to a patient. It just leads you to a group of people who have that disease. You will also find patients who are interested in the trial but will drop out when they find out what the study encompasses. For example, I once had a patient go all the way through screening. Visits one and two were 28 days apart. There were another 28 days between visits two and three, which is when randomization occurs. At that point, the patient decided to drop out. They really didn’t provide a reason, and this was after we determined they qualified for the study. That can be very frustrating, and it’s one of the reasons why patient recruitment is so difficult. Miseta: Sometimes you find sites that are a great fit for your study or where the staff seems to be more interested in it. When you find those sites, is it worth it to make a bigger investment in them? Director: When I worked at one Big Pharma company we didn’t have CROs. Our site monitors and project managers were employees. For that reason, we made the necessary investment in sites. If a site had an issue, we invested in it and developed it. Later when I joined another Big Pharma company, everything was outsourced but that model was still somewhat supported. However, when I went from there to a small company, I was on a team made up of three people. We do not have the capability to go into a site and be a supporting resource for them. That being said, I also don’t want to select 100 sites and find out only 60 of them are going to enroll patients. A factor that complicates the problem is that a site that’s great today might not be a site that’s great tomorrow. If a great study coordinator or investigator quits or retires, things can change quickly. It’s getting more difficult to select the 20 best sites because you never really know where the elite sites currently are. This is a changing world. I don’t think you’re ever going to have data to tell you which sites are best. Sites are always evolving. Miseta: Why is it still so difficult to get physicians to refer patients to trials? Director: That’s a good question. I’m not sure we know the answer. I have actually had oncology physicians tell me they will not refer patients to trials. I was told they do not believe in clinical trials and we will not refer patients to one of them. That was amazing to me. I know if I’m a patient with cancer, I would be concerned about my life and my well-being. I do think technology will help solve the problem. We can now get a patient’s vitals from their watch. Patients can Skype or teleconference with their doctors and not have to leave their home to visit a clinic. All of that will help, but the main problem is physicians are afraid of losing their patient. This is a financial decision, and we must find a way to overcome that. Let me add one more thought. I have found that if a site is referring patients to a research center that only does research, they will be more apt to make the recommendation. But when a gastroenterologist is asked to refer their patient to a trial conducted by another gastroenterologist, they won’t want to do it. That is when they will fear losing their patient if that patient starts to develop a preference for the other physician. According to research conducted on Cisco’s Visual Networking Index, just over 80% of online traffic will be video content by the year 2022. Is your healthcare organisation prepared for this upcoming shift? We’ve identified a few of the most effective changes you should prioritise on your website that will effectively help you drive more traffic and conversions from both paid and organic search activity. Video content delivers significant value in terms of showing off a hospital’s USPs, highlighting the different services offered at your facility and sharing patient stories and feedback on the care and treatment they received. Delivering this type of content in a video format can help influence a consumer’s selection process and will demonstrate the added value of a private healthcare experience. With this in mind, healthcare organisations should start implementing video content on their websites sooner rather than later, if they have not already, to stay on top of upcoming digital marketing trends. What are people searching for? Prospective patients are increasingly researching doctors who specialise in the procedure they’re looking for before scheduling a consultation with them. It makes sense as, before putting their health in the hands of a surgeon, patients want to get to know the doctors prior to consultations so they gain a sense of trust beforehand. This is where online video content proves useful, as it opens up more opportunities for doctors to show their personalities in the form of a short Q&A style video, or a less formal video to signify their passion for healthcare and areas of specialism. When positioned beside staff profiles and static head shots, these videos can help to humanise your organisation to potential patients and influence their decision. Procedural information videos can help to ease a potential patients fears or uncertainty, as well as visually and verbally explain the step-by-step process of how the procedure works. Potential patients that are more informed are more likely to take the desired action you want them to take based on the information that they have learnt. Are you planning on promoting a new service? If so, try using video content on your website to effectively showcase the benefits or process of your new treatment. This can also be utilised across other digital platforms, such as paid social, display and email marketing. Email marketing tip: Just by using the word “video” in the subject line of an email, it can increase open rates by 19%, click-through rates by 65% and reduce unsubscribes by 26%. Who better to help promote a service area such as cardiology or orthopaedics than your patients themselves? Testimonial videos can help people make informed decisions about the treatment or facility. With videos, emotions and sincerity can be conveyed much more effectively than with written content. Therefore, discovering the ins and outs of a real patient’s journey using video content is a powerful way of getting prospective patients to emotionally connect with your hospital or clinic through real-life stories. These emotions will likely lead to an action (i.e. booking a consultation) and an action will likely lead to a conversion (i.e. going ahead with the surgery). Ultimately, this can help nurture relationships and help you to stay at the top of your potential patients’ minds, increasing the chances of them choosing your hospital or practice over a competitor. SEO tip: As videos are becoming an increasingly popular form of content, search engines are more likely to show video content in the top position of the SERPs rather than other content. So, how do videos benefit paid and organic search? All in all, video content should start to be incorporated into your entire marketing strategy, from landing pages to email marketing, to add elements of personalisation to each potential patient experience, help to build trust and provide a much deeper understanding of what your healthcare company has to offer. Incorporating all of these variants of video content on your website can help drive effective results from paid and organic search. If you have either very limited or text-heavy information about each of the services you offer, people may look online elsewhere (often turning to competitor websites) because they can’t find the answers they’re searching for. With video, users can quickly find the information they need whilst gathering an overall impression of the hospital and gaining a better understanding of how the procedure works. A Google study found that out of 700 healthcare administrators surveyed, every customer reported watching videos to see product demonstrations. After watching, 79% continued to browse the website and 63% talked to others about the information they learnt. Therefore, landing pages with videos tend to generate higher conversion rates as users can find the information during their first point of contact. It’s been noted in several publications lately that that marketing to people online is starting to hit a time threshold. In other words, people have only so many hours a day to socialize, play games or hang out online. Therefore, while the number of social media ads you run is limitless (depending on budget, of course), your target persona can only view the number of ads that are displayed to them while THEY’RE online. So how does a company reach those people within their limited hours online and grab their attention on social media. 1. Know your personas inside and out. The persona marketing concept isn’t new. However, in this age of personalization and mobile technology, knowing how your persona behaves, where and how they spend their leisure time, is extremely important. Then, you can fine-tune your marketing strategy to meet your persona where and when they are online in a manner that they will respond to. 2. Market across social channels. Invite your followers to all your social media channels or create a marketing campaign that is marketed to your followers on one social channel and draws them to another one. For instance, your campaign can market to your followers on Facebook and invite them to enter a contest on Instagram. You can also market to your email mailing list and invite them to enter a contest on Facebook. 3. Provide interactive high-quality content. High-quality content that meets the needs of your persona is still the key to online marketing on any channel including social media marketing. Making content interactive appeals to online-savvy Millennials and Gen-Zers. Technology is developing rapidly including adding artificial intelligence features in the marketing mix. The more your content can be personalized for your persona, the more they are likely to engage with it. 4. Stay up-to-date with improvements in technology. With the growth of mobile devices, images, video and audio have become increasingly popular. They can be viewed or listened to easily on any-size device. Social media channels are adding video to their content offerings as seen on Facebook, Instagram, Pinterest and Twitter. Creating short videos or podcasts that can be viewed or listened to while your persona waits in line at the bank or in the doctor’s waiting room may be the opportunity you need to reach them. 5. Personalize as much as possible. Personalization is appearing on social media channels and mobile apps as well as website ordering. AI is used to learn about each persona and cater answers to that individual. This is easily seen when ordering from Amazon or using Alexa to search. Look for opportunities to put this type of personalization to use in your social media marketing campaigns. 6. Be aware when marketing to personas under 21. Valid health concerns are arising in parents of children who spend a lot of time online. When creating content for teenagers or young adults, consider not only the child persona, but the parents as well. Make your content attractive to kids in a positive and healthy manner. If you want to schedule a doctor’s appointment or check on the status of a medication without picking up the phone, Amazon Alexa can help. As of this week, the voice assistant is HIPAA compliant, which means Amazon can work with hospitals and other health providers that manage protective health data to share personal information on an Echo. But what users can’t do yet is connect with a doctor or a therapist through the device, and it might be a few years before they can. Currently, Amazon is working with applications on an invite-only basis, and none of the initial six developers link patients with doctors. Developers focused on digital health have concerns about using home speakers like the Echo and Google Home for medical consults because privacy issues continue to emerge and there’s too much risk in sensitive health information falling into the wrong hands. Earlier this week, Bloomberg reported that thousands of employees listen in to snippets of conversations on Alexa to supposedly improve the product experience. Cape’s team, which includes former Amazon and Microsoft employees, has thought a lot about whether 98point6′s technology should be available through voice assistants, but they’re not yet moving ahead with any plans. Talkspace CEO Oren Frank has also been considering how to integrate his virtual therapy app with voice technologies, including Alexa, as many of the users already prefer Siri to typing out a message. But he said he’s reluctant to trust Alexa, because it’s vital that his users feel their personal information is safely locked away. “I give Amazon the benefit of the doubt over say, Facebook, but I also realize that they’re new to providing health care services,” said Frank. For now, Amazon is focusing more on things like nutrition coaching and tools to help users find nearby health services. These are areas that involve less liability or potential for abuse, legal experts told CNBC. Meanwhile, Amazon is working on technologies that could enhance privacy in the future. For example, the company is reportedly building out better capabilities to identify specific voices in a household and is developing Alexa-integrated ear buds, which would enable users to keep other people around them from hearing the conversation. “For Amazon, this will be a long-term process that requires ongoing monitoring and training and education,” said Schoolcraft. “Compliance is a process and not a one-time step. Dr Gunter, a gynaecologist, is no stranger to social media. A prolific blogger and social media commentator, she has a stunning 148,000 Twitter followers – putting her in the top 0.1% of the Twitter elite. But even by her own stellar standards, Dr Gunter’s latest viral thread on influenza is a smash hit. Tired of hearing how flu isn’t a big deal, she called on her enormous band of followers to share their real-life #FluStory. The responses were inspiring, shocking and deeply sad. She kicked things off by describing her own son’s experience. Dr Gunter also recalled her own bout of H1N1 during the early phases of the pandemic. Some parents bravely shared stories of otherwise healthy children who had died from influenza, including a father who lost their three-year-old girl. My daughter Emily died from Influenza at age 3. This was in 2004 when vaccination was not recommended for her age group. She was healthy. Her death occurred suddenly on the 5th day of her illness, at home, and changed our lives forever. A mother described how her young son had developed a minor fever that quickly developed into a fatal illness. She has since become a vocal flu vaccine advocate and set up a website dedicated to Jude. Others shared stories of adults who had died from flu. Several posters spoke about influenza during pregnancy. The flu vaccine is recommended by the WHO for pregnant women. This mother spoke of her fear of losing a baby after she was struck down by the virus. 8 weeks pregnant w second child. Fever spiked to intractable 105+, husband on phone w OB, was told (unusually) to give me both acetaminophen& IB. Completely immobile for 3 days seriously ill for 2 weeks, terrified I would lose the pregnancy or that infx/fever had harmed fetus. Several posts focused from people who had survived the flu spoke of the disruptive effect it had had on their lives. A student in Scotland recalled how they had missed school due to influenza, fallen behind on their studies, and failed a maths exam. Health professionals were also quick to weigh in with their stories. Where should I start - with the mother I spoke with today who lost her dancing 5 year old last week. The teenage triathlete whose death devastated a whole community. The 11 mth old still in a coma at this moment. My own daughter unvaccinated for flu who now has a brain injury. This intensive care nurse described some of the horrors she has witnessed. Humbled by #flustory tweets. As an infectious disease doc I see what flu does to perfectly healthy people. As they struggle on life support, pronation, ECMO, dialysis, etc. family/docs look to us to find something else to explain what's going on. But no, it's all INFLUENZA. Do you often think about how to attract clients in your clinic and, particularly at the end of the month? To attract more patients to your dental office is not enough to be the best dentist and sit down to wait. The medical services market is extremely competitive and sometimes disloyal. Therefore, if you are a specialist doctor, dentist, or psychologist, you will surely be interested in learning these ways to attract more patients, maintain them and retain them. You will see that it is not always very easy but that some tips are simple to apply. In fact, some are designed for almost immediate, cheap implementation, using your time more than anything. There are many ways you can use social media to attract customers, and take advantage of other platforms to make your marketing efforts valuable and effortless at some point. Digital marketing is in continuous growth every year and there are always new things every month making a lot of thing change, so if you don't take advantage of social media today, there can be a day where there aren't any social media platform to use or it's very different from what we know today, so hop on in the trend and start growing your business with social media marketing. The following tips are for dentists, but they are not exclusive and any business can take advantage of these tips and customized them accordingly. Use the Positive Opinion of Your Current Patients. Request References to Your Clientele. Although it is small, it surely has a customer base with its complete data. You can make your team call and ask your current clients to give you a reference. In return, you can give them what they think is most appropriate, such as a free diagnosis or dental cleaning. Make sure that the new referral is valid, you can establish that you will give the prize if the referral passes through the clinic. Thus, you allow a means of the pressure of the referral on your patient future. That way he ensures that he will be giving compensation in exchange for a new client. Collect Testimonials and Make Success Stories. Trust is the most important in health services. Above the price of the benefit. Therefore, people want to be served by professionals who know their background. They will feel more secure. And when a person feels secure and trusts a brand is more likely that they will become a customer or return. Even if you are just starting out, you will have several cases of successful patient care at hand. It is of interest to document some of their most relevant clinical cases. In this way, you can publish them in an orderly manner in all the media available to them. This will strengthen the confidence and image in their specialty. Include Before and After Photos. You could also record some videos of your intervention. Of course, make sure to always have the patient's consent. Ask your patients to describe how they felt when passing through their hands. Request it in different social networks, Google my Business is a good place to start having reviews in order to have all your yellow stars shine. If you do not know how to do them, we recommend sending them an email with the links. The website of Your Clinic Optimized to Convert. There is no use of having a website if it is one more in the crowd on the web that nobody visits. Nor is a website that has many visits but does not produce any new client. Today in days thanks to web metrics we can know what works and what does not. You can see one of my previous blogs here and see how Google Analytics can help you track your website visitors, and you could also use Facebook Pixel (more on that later). 1) Attract visit (a user visits one or several pages of the site). 2) Convert (for example pass a call or fill out a form). 1) Easy to navigate (clear and effective design). 2) Complete and intuitive (forms and calls to action) 3) Photos and persuasive texts (unique and real). 4) Trackable by search engines (excellent SEO). Make sure to index your website in every search engine possible. Although Google is the most popular out there and the one you should focus more on, is not the only search engine, there is also Bing by Microsoft, DuckDuckGo, and more. You might never know what your clients use if you only go for one thing. Remember that you want to attract clients to your dental clinic. The image and online facility should be the same as offline. The user experience (or UX) is critical to success and get many conversions. The clinic's website should provide users with quick access to the information they are looking for. If a visitor does not find what they are looking for, they may never visit you again. That goes through well-designed buttons and links between pages: it will allow a beautiful, intuitive and converting website. People this day are more online than offline, almost everyone walking and even driving on the streets, is with their phone on their hand, so make sure that your website is fully mobile optimize because 89% of the web searches in 2018 happened on mobiles, otherwise they will get frustrated and never return. A conversion in the website of a dental clinic can be an appointment or information, either via email, telephone or the calendar. To achieve this goal you will have to place forms with a few precise fields. The old websites used only as a virtual showcase have no interest in maintaining themselves if they do not convert. It only works if you can get more patients and make it clear how to get an appointment when sailing. Nowadays, people don't have the same patient as before, so is better if you let your customers make an appointment online without the necessity to call and get put on hold. A Blog: to build a professional brand and attract customers. 1) Show your "know-how" in a subject too long to explain on a page of the website. 2) Loyalty to the patient. 3) Capture customers 4) Earn positions on Google. The most important thing is to feed the blog and your readers by producing value content each week. It will show its users (and Google) that it deserves to be considered the best specialist in its sector. 1) Practical tips to improve mouth hygiene that aren’t difficult or disturbing to do. 2) Real issues of patients and answers: you can use your social media to answer the most common question your patients have to take away the fear for the potential customers. 3) Clinical success cases: This is from a previous point saying to show before and after photos, but you don’t have to stop there you can use their photos with their review to show their satisfaction. When a user consults Google by typing, for example, "best dentist in Miami" surely you want it to be the first clinic to appear ... if your office is there. And he knows that appearing with the query "dental clinic sacred family" would not be relevant. Having a dental clinic chain, one or several clinics, optimizing local positioning at the local level is recommended since Google algorithm is always changing. But the search engine is still an algorithm and not a human person. Which means you have to help Google in providing a lot of information, such as the nearby cities and towns that the clinic covers. An interesting idea to work on is to create a landing page for each place where your buyer is located. You can always use a keyword search planner to know which keywords are the one you should be targeting, for example, you can look for dentist in Miami, see the volume of traffic and the difficulty to rank for that keyword. After you get all the keywords is now time to change your website content and keyword targeting to get rank for those specific keywords and being able to be at the top of the page. Make sure to use Google my business (more about it on this post here), Bing and Yelp are also helpful to let local customers find you easily. Online Promotion of Services and Products. 1) Periodic reviews. 2) New treatments. 3) Special offers. A good way to grab customer emails (also called lead) is from your website with a little pop-up asking them to subscribe. Also, when they make an appointment ask for their phone number and email, so you can follow up and remind them about it. You can create a short video talking about the specialties of the clinic, the professionalism of the team. Talking about the values ​​shared by the doctor's office and why it is different will be key. the buyer people of the clinic and in this way attract more clients to their office. When they know you they trust you, so make a video about you talking about your story and about your team. To Attract New Patients: Give Something for Free. The brands are on your side to support you. In many occasions, your distributor gives samples of your supplier so you can give it to your patients. The latter may even come to visit your office for the first time just for the gift. You can start a campaign by giving something of value with pre-registration online. To expand the database and get customers with just the word "free". Online marketing consultants know that the promotions and the concept of sample and gift attract attention generates a feeling of reverse debt. So when promoting your clinic, be sure to give something valuable to the patient. It does not have to represent something costly but symbolic: a basic service, a useful product with its name, etc. It's time for Facebook Pixel and Google Analytics to show up. Put those plugins on your website (or ask your developer) and with this plugins you can track every visitor of your website and can put an ad on Facebook, Google search, or other blogs that use ads special for your previous visitors, that way they get used to your brand and be more likely to convert in the future. The optician or dermatologist surely shares the same clients as those of a dental clinic. The idea is to create alliances with these professionals with the intention, for example, of exchanging references or building a service portal together. If they are in the same branch (medicine) is even better. Establishes Family Packages and for Employees of Nearby Companies. Companies such as Spotify, Apple, and Netflix propose this marketing strategy also said of the good, bad and ugly. You can use this strategy to guide the good to be a family package when someone lands on a landing page that contains the keyword "child". Since a child will not look for a medical solution on the Internet. The parents will assume that it is a "child" consultation and won't have to read anything else. You can repeat this strategy for the companies that surround your office, proposing directly to the board of directors some of the benefits that they and their employees will receive. Let social networks act as an amplifier of your messages and actions. Publish all your blog posts on social networks. Social networks are the place where your audience spends a lot of time. They have effectively managed to retain the attention of millions of users daily. That includes your future patients. With a marketing expert, determine your buyer people and your favorite social networks. Create the target audience in the advertising management of the network. In this sense, Facebook and LinkedIn are very precise and provide great opportunities to contact their patients. This will show your messages only to the people you want. It does not help to show an advertisement or a message to someone who will never buy from you. For example, it is unlikely that children under 30 are sensitive to crowns and implantology. So you can decide that they do not see your special implant promotion. How in each action to attract clients, we will determine KPI and objectives with the goal of improving each result. If you want professionals to effectively manage your communications through social networks and more, fill out the form and get a free audit. We know that you don't have time to spend on social media or on the internet creating a campaign that will attract good patients to your office. Create a questionnaire to ask how to improve the overall experience the patient had. From access to the office to dismissal. You can discover elements such as the address in Google maps is wrong, the music in the waiting room is very high or many things that will allow you to improve. In case something does not happen as expected, it is important that you have emergency plans to solve a problem right away. A bad reputation is created more quickly than forging a good reputation. Both online and offline you should plan what to do in each case. Also, make sure that your office information is up-to-date on every platform you are using because there is nothing more annoying than finding a restaurant/office on google maps that are supposed to be open and when you get there is close or it’s not even there. Medical services like in a dental clinic are very competitive. As you have seen, it is about taking care of many details and building a powerful brand little by little. Strategies in dental marketing always come from good content marketing that adds value to patients. The patient is multi-channel, and you must be present where he is. Now you know some ways to get new clients in dental clinics that you can already employ. If you want to trust dental marketing professionals do not hesitate to fill out the form and get a free audit. You can always leave your questions and comments below. Patients like when their doctors respond directly to the bad reviews they post online, nearly doubling patient satisfaction rates and dropping the rate of dissatisfaction by as much as 59%, according to a survey from a practice management software company. Patientpop surveyed 839 patients on their experiences with online reviews. Most (75%) have gone online to get information for choosing a doctor, and patients age 30-44 (86%) are the most active users in that category. The majority (65%) of that age group checks reviews and 40% said they post their own. Physicians aren't wild about online reviews, especially when they're made by anonymous accounts. Patient-posted ratings and reviews can have an effect on a practice's bottom line and public perception — enough to deter potential new patients, experts say. And more Americans are deciding to post their opinions of doctor performance, according to online reputation management firm Binary Fountain. Its recent survey found that 51% of respondents said they share their personal medical experience through social media or online review sites — up 65% from a year earlier. Online reviews can be a useful tool for doctors who to want to get a gauge on what their patients think of them and how they interpret their advice. A Penn Medicine study published in February found "told" was the most common word associated with negative hospital reviews online. The study's authors said the findings highlight the need for providers to use caring language when delivering care. "Great" and "friendly" topped the list of frequent words used in positive reviews. Those are the words providers like Intermountain and Geisinger are hoping their patients see. The health systems have continued their practice of posting experiences with hospital clinicians online — whether good or bad — in an effort to increase transparency, move away from relying on CMS' troubled star rating system and to help physicians know what patients think of them. At Geisinger, those who are unhappy with the care they received can request refunds for as much as $2,000. Yevgeniy Feyman, coauthor of the Manhattan Institute report Yelp for Health, said at Health Datapalooza last year providers should be more responsive to patients posting about their experiences online. "We're moving to a health system where patient ratings are becoming more important, where top down ratings are really inaccessible to patients and probably not that useful," he said. Thousands of patients spend time on Twitter talking about their cancer, or diabetes, or psoriasis, or almost any diagnosis you can imagine. As a reporter, you can find patients to interview while absorbing valuable background here. You can find an individual to be the face of your story, or sharpen your perspective on a chronic disease by reading about the experiences of dozens of patients living with it. These insights can change the questions you ask and the direction of your reporting. Think of a middle school cafeteria at lunch. Students clump together by interest. One table is people who play Fortnite, another is theater folks, and another is football players. The same thing happens on Twitter. Dozens of weekly live chats happen around health. Many are organized by a diagnosis, such as breast cancer. If you know the right hashtag, you can find knowledgeable patient leaders and followers talking about newsworthy topics. To extend the metaphor, you can sit down at the table with a crowd of people talking about your story topic. One of the most well-known of these tags is #bcsm, which stands for breast cancer social media. Begin your search at the Healthcare Hashtag Project at a website called Symplur. Symplur is a for-profit company that sells information about social media analytics, but maintains some free data, including the hashtag project. Search for a disease to see the tags related to it. Once you settle on one, you will see individual “names” or Twitter handles, sorted mathematically to show the most influential first. In many cases, live chats have leaders who set the agenda and moderate as people comment. These leaders are often people who have been dedicated to advocacy in a specific disease for a decade or more. One of the leaders of the #bcsm chat is patient Alicia Staley, for example. On Symplur, you can also download a free transcript of chats from a designated time period. Because Twitter posts are public, a reporter may “quote” someone’s tweets. Publications handle this in different ways. Sometimes the tweet is embedded into your story and appears just as it does on the platform. Other times you can excerpt a quote just as if you had overheard it. Your editors or publication will have a style guideline for this. Here are a few ways to contact people on Twitter if you don’t have their emails: 1) Write a direct message or DM to them. Some people have their account configured so DM is open. Others don’t accept DMs unless they come from someone they follow. 2) Reply to their post by posting, “I’m Nancy Smith from X Magazine, and could I talk to you about this comment? Write me at info[at]magazine.com, please.” 3) Post openly that you’re reporting about a topic and invite anyone to write you at a specific email, or by DMs directly on Twitter. Be sure to include the relevant hashtags in your tweet to reach your target audiences. 4) Patients might have contact information in their bio on Twitter, so their email might be discoverable. 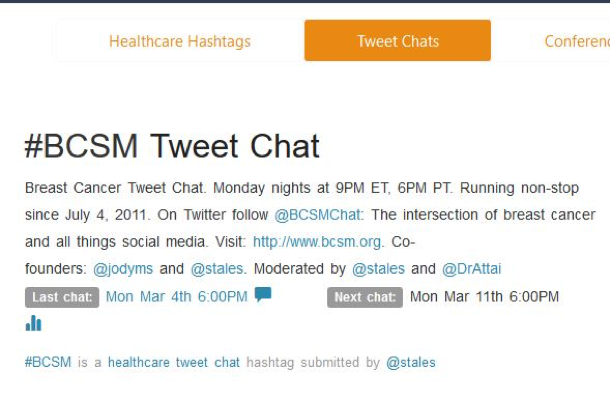 If you fear that patients talking with each other are always whining and possibly sharing less-than-credible medical advice, know that #bcsm chats frequently include very astute patients and physicians and researchers too. One #bcsm moderator is Dr. Deanna Attai, a UCLA surgeon and past president of the American Society of Breast Surgeons. I’ve seen chats where detailed clinical research protocols are discussed, digested, and risks and benefits debated. Keep in mind that patients can have conflicts of interest, just like physicians and institutions can. Ask a patient if they receive any financial support from pharmaceutical companies, for example. Some might accept travel grant money to attend research conferences, and this might not make them less credible in your interview, but it is important to know and report. A 2018 report by Kaiser Health News detailed how patient advocacy groups, not individual patients, received millions from the drug industry. Reporters should treat patient sources just as they do others — trying to verify that the person knows their territory. You can investigate the expertise of patient sources in several ways. Find examples of what the patient says about him or herself at any blog or bio that is posted. Find evidence that a patient has spoken in public before for credible organizations. If you are quoting the patient to tell you how it feels to have rheumatoid arthritis, of course, they are credible on their own experience. But if you are quoting them criticizing diagnosis or financial issues, you may want to hold them to a different standard. Utilizing Social media in your healthcare business is an opportune way to reach new, potential clients and engage with the patients you already have. But when you run a busy medical practice, sidetracking staff from their daily responsibilities to focus on social media can be overwhelming. Here are five ways to simplify your social media strategy to help relieve your team and keep your patients happy. Not all platforms are created equal and before you dive in, it is important that you recognize this. Do your research ahead of time to save yourself time during the process. It’s important to understand the audience and overall purpose of each platform. Each unique audience has its own expectations for what it wants to see. Videos tend to work better on Facebook, while LinkedIn is a place to find industry-related content. When planning out your healthcare social media strategy, keep in mind that you don’t have to manage a profile on every platform. Use the data you gather about each audience and pick the ones that benefit your practice the most. Setting up a profile on a social network is the first step, but it is only a small one in the grand scheme of things. Make sure you are consistently active in your social media strategy. Plan to post between five and seven days a week on Facebook, LinkedIn, Instagram and Twitter. If you find that one of these platforms isn’t working for you, there is no need to keep wasting time. Eliminate that network and focus more time on one that works. Once you have your schedule planned, save yourself some time and use social media automation. Plan your social media posts well in advance and schedule them to publish at a later date and time. There are online tools available that let you schedule, track and manage each of your social platforms all in one space. You can monitor what patients are saying and respond almost instantly. Automation helps save time, maintain consistent content and target your audience. Healthcare content has now evolved to include blogs, articles, videos, podcasts, photos, interactive pieces and more. There’s so much good content at your fingertips so keep this in mind as you put together your strategy. Remember to consider each network’s audience when posting certain types of content, and mix it up periodically. Don’t get stuck posting the same generic content on Facebook every day, your content and your business will quickly become stale with your followers. Post an engaging video with one of the doctors, share a trending link, followed by an in-house written piece. Sharing exciting content will not only keep your audience engaged, but it will help develop a positive online reputation for your organization. Knowing what will work for your practice ahead of time will save a lot of time and energy during the process. Avoid disasters before they happen. In a bustling medical practice, the last thing you want to do is waste time dealing with a social media disaster. When building out social media profiles, best practices apply across the board. Your social media marketing strategy should center on your practice’s business profiles, not your personal profiles. You may also consider adding a privacy notice in the about section of your social profiles explaining that patient healthcare is confidential and that your practice respects your patients’ right to privacy. No matter where you are publishing online content, you must always adhere to HIPAA. This includes getting releases before posting patient names, stories, images or videos. Getting your healthcare social media strategy into motion is a great first step, but paid advertising helps you get more bang for your buck. Combining paid with organic social media posts allows you to specifically target your ideal demographic. Approach every paid post similarly to any paid marketing campaign; with a strict budget and a strong strategy. The best medical practices on social media are dedicated to educating their audience, providing engaging content and building a reputation as a credible source. To succeed and maximize your time and efforts, it’s essential that the process is simple and you plan ahead. Be sure to share any of your social media tips on our Facebook page! An international priority is to engage patients at-risk of or living with chronic obstructive pulmonary disease (COPD) in online research and self-management programmes to establish evidence for their efficacy and obtain patient perspectives about healthcare . Participatory social media and electronic research registries pose opportunities for stakeholders to readily access this patient population [2–4]. Despite increased access, patients with COPD continue to report limited willingness to participate in online disease-specific programmes and studies . Recruitment is a science; it is a systematic and strategic process that is dependent on the values and needs of an intended audience. Identifying recruitment strategies, including message design, modality and timing, that are salient to an audience is critical to this process . Social media and research registries are networks to reach patients with COPD for research and practice ; however, strategies to optimise their use for recruitment are less well known. Combined use of online and offline methods alongside reminder notifications is recommended to optimise enrolment . Pre-notifications inform individuals about an upcoming study, cognitively preparing them for the formal invitation and the opportunity make an informed decision about participation . Pre-notification messages enhance enrolment rates in health survey research among adults over the age of 45 years ; however, inconsistent evidence exists for the efficacy of survey pre-notifications delivered by mail or email [11, 12]. Despite widespread adoption of the Internet, patients with COPD are older and experience sporadic negative health events that influence their frequency of using online media to access recruitment messages . Examining the efficacy of online and offline pre-notification messages that are salient to the priority audience is crucial to identify effective recruitment procedures. In this report, we provide evidence for the efficacy of social media and research registry recruitment procedures for online COPD survey research. We examined if enrolment rates to an online survey differ across these two networks. We also examined how personalised pre-notifications co-created by patients and delivered to research registry members, by email or mail, can influence enrolment rates. Special attention was paid to examining enrolment differences by socio-geo-demographics and the degree of respiratory symptom severity. Ethical approval for all study procedures were approved by the lead researchers' Institutional Review Board at the University of Florida in Gainesville, FL, USA. Upon completing an informed consent form, 10 patients with COPD belonging to a community-engaged research programme co-created the recruitment message with the lead researcher. Informants were mean±sd 64.40±16.35 years old, Caucasian (60%) or African American (40%), and college educated (60%) but earning USD 20 000 per year or less (80%). The message was initially drafted by the lead researcher and independently revised and edited by these informants through an iterative process. The procedure was guided by principles of message design in health research recruitment , which include elements of completeness (i.e. is the study purpose and participation process clear? ), relevance (i.e. does the message draw your attention?) and credibility (i.e. is the message source perceived as trustworthy and of high quality?). Participants were recruited for 1 week in April 2018. The 20-min survey included an electronic informed consent, followed by sociodemographics, including age and self-reported rurality (1=urban; 5=rural), and measures to assess COPD-related information seeking experiences, attitudes and beliefs. The presence of four respiratory symptoms (dyspnoea, cough, chest congestion and fatigue) was also measured (1=strongly disagree; 5=strongly agree) . A National Institutes of Health-funded university-based research registry was used to identify 2100 eligible patients who were assigned a J40–J47 (minus J45) ICD-10 (International Classification of Diseases 10th Revision) code in their electronic health record, were at least 40 years old and had an email address on file. An equal number of participants were randomly assigned to one of three pre-notification groups: 1) an email message (n=700); 2) a United States Postal Service (USPS) mail letter with survey link (n=700); and 3) control (n=700). Email “bounce-backs” were reassigned to a pre-notification group using random simple sample procedures. Pre-notifications were delivered 3 days before the official email invitation. Reminder emails were delivered 3 days and 1 week after the official invitation. Among those invited, 436 (20.76%) attempted the survey. Of those who attempted, 283 (64.91%) completed at least half the survey. The recruitment message and survey link were posted on a research listing webpage hosted by a university medical research centre. Language from the co-created pre-notification message was echoed in the social media content. Unsolicited public users shared the webpage on Facebook COPD groups. Of the 332 who attempted the survey, 292 (88.25%) completed half of the survey items in consideration for subsequent analyses. Table 1 presents the sociodemographic characteristics of 575 participants recruited through social media and the research registry. Chi-squared analyses were computed to detect statistically significant (p<0.05) differences between social media and registry respondents. Compared with the social media group, research registry participants were more likely to be older females with less severe respiratory symptoms who identified with rural culture and reside in a rural region. Research registry participants were also retired, earning USD 0–24 999 per year, with health insurance and a history of marriage. Sociodemographics were nearly balanced across research registry pre-notification groups. Participants who received a pre-notification message were more likely to complete the survey than participants who did not receive a pre-notification (77.7% and 22.3%, respectively), χ2 (1, n=283)=283, p<0.001. In regard to the type of pre-notification, USPS mail pre-notifications were superior to email pre-notifications (65.6% and 61.3%, respectively), χ2 (1, n=283)=113.85, p<0.001. Instagram is on the rise, and will no doubt play a bigger part in healthcare communicators’ social media strategies over the course of this year. With Facebook reach on the ever-steady decline, and Instagram’s active audience now rising above a billion per month, it makes sense to add the image-sharing platform to your social media mix. Why use Instagram for healthcare marketing? Instagram (IG) enables healthcare providers the opportunity to connect in an immediate way with their patients. It is particularly good for community outreach activities and patient education. Healthcare providers can also use IG to show users a behind-the-scenes view of their practice. Here’s how board-certified plastic surgeon, Jonathan Kaplan MD describes his approach to using IG in his practice. By watching us in our “natural habitat,” the prospective patients feel like they know us. We seem more approachable. By the time they show up, there’s more rapport between us vs patients unengaged with us on social media. Dermatologists, cosmetic dentists, and plastic surgeons can benefit from Instagram by using photos or video to illustrate their services. Practices can showcase before and after photos of patients, as well as videos or illustrations that educate patients on procedures and treatments. When you create a business account on Instagram, you’ll be able to get insights about your stories, posts, and followers. With an Instagram business profile, you can see real-time metrics on how your stories and promoted posts perform, and get insights into how followers are interacting with your content. Next, choose an Instagram username – pick a name that clearly identifies you, your practice, and/or your specialty. Your bio is an opportunity to make a first impression, to articulate what your business offers and why people should care. Your bio should explain who you are and what you do while conveying your brand’s identity. Adding a profile image that’s high quality and reflects your business is a must. Be sure that your IG is aligned with your website and other social media channels in terms of branding and imagery. Take a look at how these healthcare providers are using Instagram in their online marketing. For a medical student’s view of Instagram, read 8 reasons why Instagram is important in medicine. A machine learning approach utilizing social media comments helped to identify patient and caregiver needs among those affected by an ovarian cancer diagnosis, which in turn, could help to create improved interventions, according to study findings presented at the Oncology Nursing Society’s 44th Annual Congress. Therefore, in the first study of its kind, researchers from the University of Pittsburgh and the University of British Columbia used a machine learning approach to analyze the language of this population on social media as a means of understanding their concerns so that better interventions can be developed for them and research can be focused on their greatest needs. The approach aimed to supplement survey questionnaires and interviews as ways to gather this information, said lead author Young Ji Lee, Ph.D., M.S., RN, assistant professor in the School of Nursing at the University of Pittsburgh School of Medicine. She called the method especially relevant at a time when patient-generated health information is increasingly informing care. The researchers analyzed the initial postings of nearly 855 patients and caregivers who commented in the Cancer Survivors Network online peer-support forum between 2006 and 2016. They applied machine learning, using simple natural language-processing techniques, to build a model that decided whether each posting fell into one or more of 12 categories, including physical, psychological/emotional, family-related, social, interpersonal/intimacy, practical, daily living, spiritual/existential, health information, patient-clinician communication, cognitive needs and miscellaneous. The model used bag-of-words features, considering each word in a posting for its potential in classifying needs. The researchers identified important features for each need category using mathematical analysis and performance metrics. They found that the most frequently occurring needs across postings were health information (456 posts), social (307 posts), psychological/emotional (141 posts) and physical (109 posts), of which physical, psychological, health and social needs were identified most accurately by the machine learning model. Less frequently occurring categories were miscellaneous (74 posts), family-related (53 posts), practical (35 posts), patient-clinician communication (19 posts), interpersonal/intimacy (14 posts), spiritual/existential (10 posts), daily living (five posts) and cognitive (four posts). Of all the postings, 38% described multiple needs, and of those, 40% described social and informational needs together. Words describing psychological states, such as “anger” and “anxiety,” were important features for the classification of psychological/emotional and social needs, and medical terms, such as “endoscopy” and “colonoscopy,” were predictive that a post would focus on physical and informational needs. The researchers concluded that even simple programs for word analysis can detect patient and caregiver needs with a high degree of accuracy, and that the same exercises can predict multiple needs at once, highlighting the need for future use of these models to help patients and their caregivers. Patient influencers trust social media groups more than pharma websites for health information, according to a survey from Wego Health. These influencers are most likely to turn to groups on Facebook, Instagram and Twitter as their first source for health information, followed by health websites such as WebMD, patient advocacy organization portals, their doctor, patient blogs and YouTube. Only 3% said they prefer pharma websites. Pharma websites also ranked low on the list of the most trusted sources of health information, only above YouTube. Health websites such as WebMD or those by the Mayo Clinic, healthcare providers and patient advocacy websites were the most trusted. Advocacy groups and doctors also beat pharma companies and specific drug brands in terms of attracting followers. Nine out of 10 respondents said they follow a health advocacy organization, but only 20% to 30% follow a pharma company. Patient influencers are more likely to follow a pharma drug brand if they take that medicine. Goldsmith said pharma has “a lot to learn” from influencers. The report classified people as influencers if they have a measurable footprint and a critical mass of followers on social channels, he added. Wego put influencers into two groups: nano-influencers, who have up to 1,000 followers, and macro-influencers, who have between 1,000 and 5,000 followers. The report also delved into influencers’ preferred platforms. Facebook is king among this group, likely because of its private-group and messaging features. Nearly all (98%) of patient influencers use Facebook; 94% are members of a health-related group and 89% share health information publicly on the platform. Given privacy concerns about Facebook, Goldsmith said patients on the platform and sharing health information is still “significant.” About half of influencers said the privacy scandals did not change their use of Facebook, and only 3% have stopped using it or deleted their account. However, Facebook did take a hit on trust. The influencers ranked Twitter and Instagram as the most trusted networks with personal data. A third of influencers said if Facebook were to disappear, Instagram would be their next choice for connecting with other patients. (Facebook owns Instagram). Wego surveyed 412 patient influencers across dozens of conditions in the U.S. in February. When marketing to doctors for referrals, use these strategies to successfully communicate your message. Effectively reaching physicians with traditional marketing tactics can be challenging. While there are many techniques for communication in general—many of which we have written about here before—hospitals and health systems often question these methods when trying to encourage referrals from physicians. As with any approach, there is no one-size-fits-all method. Each area is different, and knowing your own market dynamics will give you a solid ground to stand on when creating a strategy. If doctors are going to trust another physician or specialty program enough to refer their patients to the organization, they need to know who they are sending them to. Strong content plays a key role, so it’s critical to consider the information you choose to promote. What are the stats and data that doctors care about when learning about referral options? How do you convince them? Try to focus on the advanced technology the physicians use, if they participate in certain clinical trials and if a specialist on the team is the only physician in the area offering a certain procedure. At the root of it, content of this type builds professional trust. Much of healthcare marketing now speaks to a holistic approach to care—not just treating a disease, but treating a person. Physician referral marketing is no different. Data is just numbers if it doesn’t resonate with your audience. But what data matters to physicians and will drive them to make a referral, and which distribution channels should you use to promote your content? If doctors don’t access your content and the data you present—no matter how compelling it is—all your hard work is a wasted effort. Here are proven tips for identifying and presenting data to your doctors. Keeping in mind that your audience—doctors—are scientists, you need to speak their language. Use stats that communicate the positive impact of referrals and deliver details about outcomes, satisfaction and other relevant measures. This allows you to nurture the physicians’ trust, helping them understand that their referred patients will be taken care of. “When a population skims content rather than reading it—as we’ve learned physicians and all readers often do nowadays—infographics have proven to be an extremely successful way to share information,” Bennett says. An infographic breaks down data into small, visual tidbits, which makes it easy to consume and digest. And, with the added visual element, it holds engagement longer than a written article may. Infographics have a long shelf life, too. Once created, they can be used in a print magazine (maybe as a tear-out element), made into a poster or shared on social medial. Because they’re engaging, infographics have the potential to reach an audience quickly, and they clearly illustrate the key facts and the main point in a way that grabs attention. Granting your audience a clear path to access to your content is also important. Physicians are extremely busy. Knowing where to speak to them is key. When marketing to doctors for referrals, carefully consider whether your physician marketing strategy includes a lean-in or lean-back approach. Social media and digital content require a lean-in approach for readers, as they have to seek it out and find it. However, a print publication gets delivered to a physician's home or office and allows them to lean back and consume the content in a more relaxed way. Consider your approach and your clinical audiences’ access to your content. And, of course, no matter who you're trying to reach: Consider an integrated content strategy to get the most mileage out of all content you create and publish. Since finishing my medical training recently, many of my friends have embraced their newfound freedom as attendings in traditional ways: reviving long-neglected hobbies, finally exercising regularly, enjoying more time with loved ones. It may seem like a strange step, but after years of caution regarding the perils of social media as a physician (and more specifically, as a child, adolescent and adult psychiatrist), it was only once I had my fellowship certificate in hand — and thus the confidence that a wayward tweet would not sabotage my future — that I had the confidence to take the plunge. Overall, I’m glad I did. 1. Expose yourself to medical specialties other than your own. I’ve spent much of my time hanging around #medtwitter, which is inhabited by MDs of all specialties: I follow emergency docs, surgeons, pediatricians, ophthalmologists and more. #Medtwitter offers a unique look into other medical subcultures and allows me easy access to debates and conversations taking place within their communities. #Medtwitter provides an opportunity for cross-pollination and an antidote to the medical specialty silo. Through Twitter, I’ve been exposed to docs like @vinayprasadmph, who masterfully breaks down flawed papers, or @choo_ek, who advocates and educates around topics such as sexism or racism in medicine with sharp wit and humor. 2. Connect with colleagues in your field — especially non-MDs. In just three months, I’ve built a virtual network of doctors, psychologists, social workers and more, with a broad range of interests that overlap with mine. Without Twitter, it would be particularly hard for me to find and connect to non-MDs: for example, I have an interest in human-centered design, so I follow a number of design-focused folks, which allows for easily sharing ideas across disciplines. Sure, these twitter connections are no replacement for colleagues and friends IRL (in real life), but they’re a wonderful complement to my existing community. 3. Consult and learn from colleagues. Often, I’ll see MDs pose a question, and immediately get lots of honest and helpful input. I’ve also come to appreciate MD “tweetorials” (a brief string of tweets focused on educating regarding one topic), which I’ve seen on everything from radiation of prostate cancer (@RTendulkarMD) to management of delirium (@virenkaul) to motivational interviewing of college students regarding marijuana use (@jessigold). 4. Learn directly from patients. Twitter is one of the few places where doctors and patients are literally on the same page. It’s a unique platform for learning about the patient experience. I’ve read heartwarming stories and horror stories — and everything in between. 5. Educate the public. After over a decade of training, MDs possess a unique body of knowledge. Not only must we be responsible stewardesses of this knowledge, we have an obligation to share it. The mass exposure facilitated by Twitter allows for an unprecedented dissemination of knowledge. I’m a psychiatrist, so my focus is on increasing awareness and reducing the stigma of mental illness and treatment, but all specialties have something special to contribute. 6. Counteract misinformation. Similar to the point above, while MDs may hesitate to share their knowledge and expertise on Twitter, conspiracy theorists, sellers of snake-oil, anti-vaxxers and the like have no such reservations. Some of the most inspiring MDs I see on Twitter (@yonifreedhoff) are those who relentlessly challenge the torrent of misinformation being distributed. 7. Collaborate internationally. I am currently located in Israel. My followers are from around the globe: India, England, U.S. and elsewhere. I follow people from all over. Twitter has quickly expanded my exposure to people with similar interests from all over the world in a way that would be impossible to replicate via the more traditional methods of networking, such as attending conferences. 8. Mentor and guide trainees. Years ago, as a post-baccalaureate pre-med student, I craved guidance from MDs who were settling into their careers, but it wasn’t always easy to find. Twitter is a chance to give back: from answering specific questions to providing insights and advice. For example, I started a thread inviting MDs from different disciplines to share why they chose their specialties. Before long, MDs from a diverse array of specialties chimed in, to the benefit of pre-med and med students as they consider their futures. 9. Interact with thought leaders. I frequently see intellectuals and top MDs engaging with their followers in real time, and I’ve retweeted some superstars, earning appreciative “likes” in response (the Twitter equivalent of an autograph). 10. Become amused — or inspired. Whether following hilarious (@docaroundthclok) or inspiring MDs (@drpoorman, @adamhill1212) — or the many hilarious or inspiring non-medical folk — Twitter offers comic relief, uplift and more. Certainly, Twitter is a platform with pitfalls and flaws, and MDs must be especially careful to use their professional discretion when on Twitter (there are plenty of resources for that, for example, this website featuring my fellowship director @sandradejong). But that said, it’s a great place to be amused, engaged, informed, and connected. Now, if only I could find time to exercise more regularly. Is your website mobile-friendly? This refers to how your website looks on a smart phone or tablet. Is the text easy to read? Does it display well? Over 62% of Internet users now access the Internet via a mobile device (Source: Statista). In other words, if your website is not mobile-friendly, then you are missing out on up to 62% of prospective new patients! That’s a big percentage to miss out on. You can check for free with Google’s free mobile-friendly checking tool. Tip 2: Speed up your website. In 1992 people were willing to wait 5 minutes for a photo to load. Well, that’s not the case anymore! People are demanding. They want a fast website. And if it’s not fast, they will leave your site. It’s as simple as that. Google has even admitted that it is penalizing sites which load slowly. How do I know if my website is fast enough? You can check for free with Google’s free site speed tool. How can I increase the speed of my site? A number of other possibilities. Tip 3: Content, Content, Content! In the world of SEO, content is King! This is also true of medical SEO. Why do prospective patients use Google? They are looking for answers. And if your website does not provide the answers to their question, then Google is not going to place it at the top of their search results. How can I improve the content on my website? First of all, make sure the content you are providing is useful. If prospective patients do not find the information on your website useful, then they will leave your website. This leads to a higher bounce rate, which pushes you down in the SEO rankings. But how do you know what patients find interesting? There are some useful tools to check the type of questions patients (and the public in general) are asking. Check out Answer The Public. Alternatively, simply type your keyword on Google, then look at Google’s alternative suggestions. Second, make sure that it’s immediately obvious what your page is about. It’s important to include the keywords in the title or subheadings, so that the patient can immediately see that your page is about the topic they are interested in. After a patient conducts a Google Search, they will then see 10 organic search results. These results will show a page title, URL, and snippet (description). Based on this information alone, the patient will decide if your site is what they are looking for. This is why it’s vital that your page title and description scream “click me!” to prospective patients. Having a page which is 100% text can scare away prospective patients. If patients leave your page within 30 seconds, this is considered ‘bouncing’. The higher your bounce rate, the less likely Google is to rank your page high on the next search query for the same keyword. Inserting a few images which relate to the keyword helps to reassure the patient that your page is relevant to their search. Furthermore, if the image or video can be interacted with (clicked on), then increased interaction is another indicator to Google that the patient is interested in your page. This will subsequently boost your SEO for future searches using the same keyword. As a doctor, you may be used to your handwriting being inaccessible to patients. However, when it comes to seo for medical websites, it’s vital that patients can easily read and understand your page content. This is known as ‘readability’. Readability is believed to be one of the factors included in Google’s search algorithm. In other words, try to avoid long sentences in the passive voice. Instead, use short, active sentences. It also helps to break down text into shorter paragraphs. The number of people who viewed your profile. How can I create a Google My Business profile for a doctor or a medical practice? How much does it cost to create a Google My Business profile? Nothing! Creating a Google My Business profile is absolutely free. I have a Google My Business profile but why is it not appearing on the map? Google only features 3 GMB profiles on the map at the top of search results. With thousands of other physicians and practices competing with you, you may wonder how you can increase your chances of being selected for one of the 3 positions at the top. There are a few tips for doing this. Learn how to increase your number of 5 star doctor reviews. Tip 6: Create Social Media Profiles. I have always been skeptical of the Return On Income of social media, however in terms of SEO for doctors they are very useful. The links from social media platforms (such as Facebook and Twitter) can give your practice’s website a big SEO boost. This is because they have high Domain Authorities. In other words, in the eyes of Google they are reliable backlinks. Creating social media profiles for your practice, and posting on them regularly, will give your SEO campaign a positive boost. Having high quality backlinks from reputable, third party sites will benefit your practice’s SEO campaign. More information coming soon! Google’s crawler bots constantly check for updates to websites. This will identify if your page has added any fresh content. Sites which do regularly add new content are considered ‘fresher’, which is said to be one of the factors in Google’s algorithm. This is logical. Google wants to put the best and most current sites at the top of search results. For example, if one doctor’s website has not been updated since 1995, then the content is likely to be outdated (especially in an ever-changing industry such as medicine). This subsequently decreases the chances of it ranking high on search results. More info coming soon! In the world of medical SEO, success breeds success. In other words, the more traffic you site has, the more this improves SEO. By increasing traffic to your site, it can (but not always) have a positive effect upon your practice’s SEO campaign. Social media. Building up an audience on social media can also help increase traffic to your site. Advertising. Facebook and Google Ads do (of course) cost money, but they can be a quick and effective way of driving new patients to your site. Read more about Google Ads for Doctors or Facebook Ads for Doctors. The first step in executing an effective Pay-Per-Click (PPC) strategy and campaign for clinical trials is establishing realistic goals. Here’s how CROs and sponsors can use paid search to boost enrollment, while staying within the allotted budget. PPC describes a type of digital advertising, or patient outreach, that allows marketers to create ads that appear on top of Google’s search engine results pages (SERPs). For clinical trials, these ads target active and engaged audiences who are already searching for healthcare or medical treatment. What’s more, “pay-per-click” means that CROs and sponsors don’t actually pay until a potential patient clicks on their ad — making PPC an efficient way to boost clinical trial patient recruitment and enrollment. While the value of paid search is clear, setting up a PPC campaign involves managing many moving parts. One particular area that can be challenging for CROs and sponsors is establishing a monthly budget. Because budget is dependent on a variety of factors — evolving goals and available funds, for instance — the plan should be flexible and include a range of estimates. This is important when we consider that some clinical trial sites will perform better than others, and, in order to optimize the spend (and ultimately the return on investment (ROI)), PPC activities must be carefully managed, reported, and modified accordingly. To aid with budgeting efforts, here’s how CROs and sponsors can use historical data to develop a cost-effective paid search budget, and reach new potential patients for their clinical trials. As a crucial part of any successful patient recruitment campaign using digital marketing, PPC can help speed up the enrollment process. It’s most effective when implemented before a trial begins or immediately at the start (once respective sites are initiated), but can also be rolled out on a shorter timeline to help boost enrollment numbers. Unlike posting flyers or advertising in a local newspaper, paid search targets audiences who are already looking for medical information or treatment options, the truest form of active, engaged patients. Strategies can be built to narrow audiences further through segmentation strategies like negative keywords (filtering out terms that don’t convert), and dayparting (tweaking bids according to time of day or day of the week). Studies show that 53% of patients find out about clinical trials online, making digital patient recruitment marketing a primary, cost-effective strategy, not an extra to be tacked on at the end as a “rescue” strategy. When executed properly, PPC can truly make or break a trial’s recruitment success. But first, CROs and sponsors need to establish their goals and set a paid search budget. Setting the right budget depends on identifying a clinical trial’s unique goals, such as trial/brand awareness, lead (“patient inquiry”) generation, or patient recruitment and enrollment. Once the goal is clear (i.e. “we need to recruit 20 new patients in the next month, paying no more than X dollars per patient”), CROs and sponsors will need to work with their patient recruitment vendor to determine how much traffic is required to meet that goal. In order to do this, it’s important to establish an estimated conversion rate. Marketers should look at historical data on Google Analytics to evaluate past performance and get a sense of how traffic will convert in the future. Studies that have never utilized a PPC campaign before should look at their website’s general conversion data and estimate from there. By inputting the goal of 20 patients and the conversion rate of 2% into the formula, CROs and sponsors can see that they will need to reach 1,000 users in order to convert the right number of patients. However, it’s important to keep in mind that this formula generally provides a low estimate, as targeting active and engaged patients is likely to improve the quality of site traffic. This in turn should raise the ad conversion rate, which means a lower budget may be required. But traffic is only part of the PPC picture: the next piece is determining how much each of these impressions will cost. Predicting cost-per-click (CPC) generally begins by examining historical data from previous PPC accounts. If a study is in early phase, with no previous campaign data, Keyword Planner on Google Ads can be utilized to gain key information. While this tool provides a useful benchmark, it’s important to remember that actual CPC is influenced by a variety of factors including the specific type of study, geography, ad quality and other, study-specific critical variables. While this number provides marketers a good sense of what to spend on PPC advertising, it’s also important to include a range to account for error and other factors that might cause budget changes. Next comes the bidding process, which is an important factor in determining ad placement on SERPs. Automated bidding has become more popular in the past couple of years, especially as the algorithms are becoming more advanced. However, manually setting a bid is often the best option for marketers who are just getting started with PPC campaigns. It’s important for CROs and sponsors to keep in mind that the bid doesn’t necessarily determine the amount each advertiser will pay. The actual cost is determined by a variety of factors, including the competition and the quality of the ad. Google can overspend a PPC budget for an individual day, but it won’t go beyond the average daily budget times 30.4 over the course of the month. Going through the above exercise can help to build the right budget to ensure that enrollment and budgetary needs are met. With a few simple steps, CROs and sponsors can determine how to effectively reach their recruitment goals and avoid overspending. CROs and sponsors looking for guidance in establishing a PPC campaign, and the tools to effectively manage the entire process, may want to consider working with a patient recruitment firm that specializes in digital marketing. A patient recruitment firm with specialized, digital marketing experience in clinical trials and the medical industry is essential to help sponsors and CROs reach the right patients, and to meet their enrollment goals on-time, and on-budget. Clinical trials are fundamental to the development of innovative treatments that can cure disease or improve patient quality of life. Yet patient participation rates remain low — and even when patients do volunteer, they often leave the process before it is complete. Participation is hindered by patients not being aware of trial opportunities, and the drop-out rate is high because patients enter trials that don’t meet their expectations. How can physicians ensure that their patients know which trials are available and, more importantly, that patients make a fully informed decision regarding participation? Given the importance of clinical trials for advancements in health care, both physicians and patients could benefit from taking a proactive approach to finding clinical trials rather than waiting for clinical trials to find them. Laura Akers, PhD, associate scientist at the Oregon Research Institute in Eugene, Oregon, advises physicians to “learn how to use the search function within the ClinicalTrials.gov website to find out what studies are out there and currently open to recruitment.” There is also no reason why fully educated patients can’t access this resource as well to investigate trial opportunities that might be of interest to them. When educating patients about clinical trials, a question-based approach can be useful. This ensures that not only are patients learning about trials, but they are also learning about their own needs and expectations of trial participation. This is critical to ensuring they make an informed decision about whether to become a participant. What are the medical risks and benefits of participation? Although the US Food and Drug Administration FDA has produced guidelines to help ensure the protection of participants, some risks may be inevitable. For example, if testing a new drug, there will be the risk for side effects. Equally, a benefit could be that the investigational drug has the potential to ease symptoms. Encourage patients to weigh the risks and benefits of taking part in a trial. Is there a placebo? You may need to explain that a placebo, frequently called a sugar pill, will have no medicinal benefit. It is also important to ensure patients understand they are not guaranteed to receive the investigational drug and may receive a placebo. A placebo group is needed to create a comparison or baseline for the effectiveness of the treatment being tested and so is an important component of the trial — however, not all patients will be happy in a placebo group. How will the trial affect a patient’s daily life? Patients should be informed of all commitments necessary to participate. For instance, travel, time, and expenses may be required but not reimbursed. In some instances, patients are required to keep detailed notes to assist with the monitoring process. Is the risk worth the reward? Some trials require patients to stop their medical treatment or to leave their medical provider for the duration of a clinical trial. Patients must consider whether the requirements for participating in a trial are sufficiently justified for them to change their current treatment regimen. What happens to the data? Clinical research is considered intellectual property, which means the company conducting the trial owns the data and is not required to share results or make information open to the public. Patients who are considering trial participation should be advised to enquire how their privacy will be ensured and whether they will receive any results after trial completion. Being in a position to answer all of these questions equips patients to provide fully informed consent. However, also ensure that patients understand their right to withdraw from a study at any time and for any reason, even after signing a consent form. The Ethics of Overlapping Surgery: Do Patients Have the Right to Know? Physicians are well placed to reach out to patients who may never have heard about clinical trials and those who may be misinformed as a result of previous negative experiences or media representations. There are several ways to achieve this reach, each with variable levels of effectiveness. Although the most common and arguably the most effective avenue to reach the greatest number of patients is through social media, there are certain factors that may limit the effectiveness of a physician taking this route. Henning Sievert, PhD, head of sales operations at the patient recruitment firm Clariness GmbH said, “Generally, using social media can be a cost-effective way of spreading the word and sparking discussions on any topic, including increasing trial awareness, but it is important to keep in mind that building and maintaining a community on any medium is not a simple endeavor [and] that [it] takes a lot of time and effort.” Not only does social media reach take a long period of time, but it also requires creating and sharing interesting content related to a physician’s specialty regularly. Physicians must also engage actively and meaningfully with the audience. Coupled with the daily activities of the physician, this may be too much to handle. Even deciding to simplify the process by just advertising on social media may be ineffective without previous experience. While physicians are not responsible for ensuring the success of clinical trials, they do hold responsibility for the welfare of their patients — and part of patient welfare is empowering patients with awareness of clinical trials: what they are, why they are important, how they are carried out, and who is eligible for them. Although patients can ask for such information, the proactive physician will broach the topic first, especially if they are aware of a trial that might benefit their patient. Why do patients drop out of therapy? As we explain in this WebPT Blog post, it can be for a number of reasons ranging from slow results to time constraints. But while the reasons may vary, most of them boil down to one thing: the patient just wasn’t right for physical therapy—at least not at your clinic. So, what’s a PT practitioner to do? After all, if you’re relying on referrals from physicians, there’s no guarantee that every patient they send you will be a good fit for your services. That’s where marketing comes into play—specifically, marketing to the right audience. And one way to ensure you’re attracting your ideal patients (i.e., the ones who would have the best chance of achieving success in your clinic) is to market your clinic’s culture. Before we dive into leveraging your culture to better market your clinic, let’s first discuss what company culture means. How can you market culture? 1. Meet your patients where they are. Whether you’re an organizer, participant, or sponsor, getting out in the community gives you a chance to talk with like-minded people. Perhaps more importantly, it shows them you’re passionate about the same things they are. 2. Network with other health and wellness professionals. Along with speaking directly to prospective patients, don’t hesitate to be a friendly neighbor to potential referral sources. Specifically, seek out other health-centric businesses that cater to similar clientele (e.g., physician offices, gyms, chiro clinics, and health food stores) and have missions and cultures that jibe with your own. Consider developing cross-promotions to not only drive word-of-mouth business, but also build loyalty with those referrers. By working with businesses that serve the same population as you (and have a similar culture), you know that any patients they send your way are likely to believe in your mission, too. 3. Blog about what’s happening in your clinic. 4. Highlight it in your marketing materials. Go on—it’s okay to brag a little. If you’ve got an amazing team, brilliant culture, and wonderful patients, there’s no shame in flaunting it on social media. (Just make sure you have permission before sharing pictures or names of patients!) In fact, showing off your company culture is an excellent online marketing strategy. That’s because doing so helps your patients get to know you before they even set foot in your practice. Better yet, seeing how gung-ho your staff and patients are about being there will get those potential patients excited about you, too. Helps you tell your clinic’s stories in a medium people are more likely to engage with. Allows your audience to connect with you and your clinic on a more personal, authentic level and thus, instills trust. Makes your practice a destination (so, instead of being just another PT clinic, your clinic is the one that made that cute “Safety Dance” video). Testimonials are perfect for social sharing. If you’re tracking your patients’ experience in your practice—which you absolutely should be doing—you can leverage this information by asking your happiest patients to provide you reviews and testimonials. (The Net Promoter Score® [NPS®] is the best way to track this, and we explain the how and why here.) Once you have your testimonials, be sure to obtain written permission to share them for marketing purposes; then, feature them on social media, your website, or other marketing materials. Having real-life recommendations from actual patients is a great way to build trust and establish credibility in your community, and prospective patients will respond to that. For example, by infusing its fun staff culture into patient interactions, East Coast-based Pivot Physical Therapy makes true believers out of its patients (evidenced by this patient testimonial): “Possibly the most important thing, everyone at Pivot Physical Therapy is fun and great to be around. I look forward to getting away from work and ‘playing’ at your facilities.” Not only does this speak to Pivot’s amazing culture, but it also helps ease patient anxieties about how grueling physical therapy can be—making it an ideal testimonial to post online. Content marketing and SEO for the healthcare sector are different from other industries. Learn how to use the right content to acquire top spots in the search results. What does an average patient do when he or she experiences adverse symptoms? Twenty years ago, they would have called the doctor. Today, they open up their browser. According to research by Pew Internet & American Life Project, 55% of adult internet users search for health-related information online. Companies from the medical sector can take advantage of the client’s desire to search for extensive information. If you have the right content, your SEO efforts can improve trifold. This step-by-step guide can help you take a smart approach to content marketing in your field. As an SEO expert with over 15 years of experience, I’ve come up with a few smart, sly, and important tips that will help you achieve your SEO goals. Who are your patients? Of course, you know the answer to this question. Or do you? Make a list of the patients who are likely to visit your office according to the following parameters. Demographics – age, gender, family size (composition), occupation, income, and education. Psychographics – behavior, lifestyle, personality. This is especially important for older patients, who may not accept innovative technologies while being highly receptive to word-of-mouth marketing. Needs – what does a patient need? What is their likely level of knowledge about the conditions are you are treating? Where do they usually find their information? You may find that your audience is between 30 and 40, married with one or two children, educated, income over $50,000, busy and in search of quick solutions, likely to use internet for information, mostly on their mobile gadgets. Or you may find out that your audience is between 65 and 75, married, educated, retired, not highly active, looking for extensive information to make a decision, need time to decide, not too internet-savvy. Two completely different pictures, right? Can you see how the content you employ will be different or these two audiences? In the first case, when marketing your services, you are likely to focus on the latest technological solutions in your sector, fast access to services, and top-notch options at extra cost (if any). This audience is also likely to download your company’s app. In the second case, you may want to focus on giving extensive information about your solutions as well as offering full information about your credentials and sources. Calls to action should focus on calling a representative to get more information. The content can share solutions with a lower price tag than for the first audience. What are the questions your target audience is asking about their health? Your business should anticipate what exactly potential patients will search for online. Which doctor deals with eyes? These types of requests are highly common. When you are writing your content, you should be keeping the patient in mind. For example, an average patient is unlikely to search for “otitis,” which is a specific type of ear pain. They will, instead, simply type “ear pain” into the search engine. View the content from the reader’s perspective. Your goal is to give a solution, not to shower a person with information and jargon they don’t understand. Smart tip: Be careful about giving direct advice in the articles you post on your website. While telemedicine is on the rise, it comes with its own set of rules. Important tip: Don’t jump in over your head. If you aren’t competent or don’t have the resources to answer a question, don’t do it. You should always value the patient’s health over your own content marketing. Social media content marketing can improve your SEO efforts. According to Pew Research, 80% of internet users, who engage on social media, are specifically looking for health information, and nearly half are searching for information about a specific doctor. Content marketing on social media is somewhat different than on-site. You need to be concise while engaging the audience. On social media, you should follow all the latest trends in your sector. Try to be one of the first people to discuss any new findings in a way for the average patient to understand it. Anything new and important to your audience will be reposted in the blink of an eye, bringing more subscribers to your account and more viewers to your website. In fact, doctor’s social media accounts tend to show up in the search engine results quicker than websites. Take advantage of this information to market your office through particular specialists. While there isn’t anything funny about being sick, reading long and boring medical texts is, well, long and boring. According to SEO experts from a digital service agency, Miromind, adding a human element to the content you are writing is a must-have. Help the patients relax when they are reading your content. The more you identify with your target audience and make your content visually appealing, the likelier they are to convert. One of the simplest ways to make content more engaging is to diversify it with images and videos. These days, videos are gaining immense popularity. Smart tip: Your medicine-related videos shouldn’t swallow large portions of your budget. They can boil down to a specialist speaking about a certain subject in front of a camera. Sly tip: Tell a funny story. Humor always sells. Even when it’s in the middle of something terribly serious. Did you answer at least two questions important to your audience? Did you add the entertainment factor to the content? Are you speaking in the voice of a leader? Is your information useful and relevant? Did you share original thoughts or an alternative point of view? Did you give a call to action, which directs the patient to make an appointment? Did you make the information easy to share? Did you write a concise and catchy summary for social media? Don’t miss any of the above. Even if it seems that the text looks better without one of the points, find a way to include it. Don’t make the mistake of saving money on a website designer and SEO consultant and lose quality content. No matter how amazing your marketing efforts are, they’ll fail if the content isn’t readable. What I mean by readable is the content’s physical appearance. You should always write digital content in short paragraphs that are filled with bullet points and images. Creating a less overwhelming block of text makes it easier for your reader to stay engaged. Which one of the above would you continue reading? Making your content easy to read will encourage people to stay on your article instead of clicking away. You never want to overwhelm potential readers with information and huge blocks of text can deter people. Don’t avoid readability issues. Start with them. The medical sector is an excellent field for building out your content marketing efforts. An overwhelming number of people are turning to the internet for medical advice. By creating the right content, it’s easier to end up on the first pages of the search results than in any other industry. When someone searches for a medical professional, your website should show up first. Don’t miss out on potential opportunities because people can’t find your website. Create valuable and readable content that people find when looking for answers to their medical issues. Hire an SEO agency if you are unsure of how to best support your site. Strive to share information your target audience is looking for and watch your clients increase. Background: The number of patient online reviews (PORs) has grown significantly, and PORs have played an increasingly important role in patients’ choice of health care providers. Objective: The objective of our study was to systematically review studies on PORs, summarize the major findings and study characteristics, identify literature gaps, and make recommendations for future research. Methods: A major database search was completed in January 2019. Studies were included if they (1) focused on PORs of physicians and hospitals, (2) reported qualitative or quantitative results from analysis of PORs, and (3) peer-reviewed empirical studies. Study characteristics and major findings were synthesized using predesigned tables. Results: A total of 63 studies (69 articles) that met the above criteria were included in the review. Most studies (n=48) were conducted in the United States, including Puerto Rico, and the remaining were from Europe, Australia, and China. Earlier studies (published before 2010) used content analysis with small sample sizes; more recent studies retrieved and analyzed larger datasets using machine learning technologies. The number of PORs ranged from fewer than 200 to over 700,000. About 90% of the studies were focused on clinicians, typically specialists such as surgeons; 27% covered health care organizations, typically hospitals; and some studied both. A majority of PORs were positive and patients’ comments on their providers were favorable. Although most studies were descriptive, some compared PORs with traditional surveys of patient experience and found a high degree of correlation and some compared PORs with clinical outcomes but found a low level of correlation. Conclusions: PORs contain valuable information that can generate insights into quality of care and patient-provider relationship, but it has not been systematically used for studies of health care quality. With the advancement of machine learning and data analysis tools, we anticipate more research on PORs based on testable hypotheses and rigorous analytic methods. Sharing the right kind of content on your social media accounts can help your practice earn more new patients and keep them engaged when they’re outside of your office. If you know your audience, then you know what they are looking for in content. You are also aware of their expectations and have a good handle on the type of content they will want to read. Use your familiarity with your patients as a compass to guide you when planning your content creation strategy. An informal office tour video is a great way to share the personality of your office with new, potential patients and entice them to schedule an appointment. You’ll want to record your waiting area and highlight any of the fun activities that children can enjoy while in your office. You can make a series of short (less than 30 seconds) videos highlighting individual areas or shoot a long shot walkthrough of your dental office. Your goal is to make your dental office feel like a fun and comfortable place for patients to visit. Lists are some of the most popular items on social and represent 12% of all posts shared. Your lists don’t need to be just about dentistry. A list is a great way to share your personal thoughts about the cities you serve. Consider making a list about your favorite places to grab sushi near your practice. Be sure to use local keywords in the introduction and conclusion of your post. Dental patients are full of questions – and you can provide the answers! Use your social media accounts, or time in office to listen to your patients and track the most common questions. Then, use your blog to write out the most popular questions, and answer them in the body of the post. If you ask for questions on social media, be sure to tag the person that asked the original question in your answer. Believe it or not, toothbrushing videos are some of the most viewed content on YouTube! You can help your young brushers continue to build healthy habits at home by sharing your favorite toothbrushing kids. be sure that the video is at least two minutes long and is up to your professional standards. You can go the extra mile by creating your own toothbrushing video, but there are a lot to choose form online. Smile Savvy’s Social Media services offer comprehensive social media management and informative blog posts that drive more traffic to your dental practice. Click here for more information about how our Social Media services can help your dental practice. Would you like me to help you with your Social Media Activities?